Heroic Leadership is a celebration of our greatest heroes, from legends such as Mahatma Gandhi to the legions of unsung heroes who transform our world quietly behind the scenes. The authors argue that all great heroes are also great leaders. The term ‘heroic leadership’ is coined to describe how heroism and leadership are intertwined, and how our most cherished heroes are also our most transforming leaders. This book offers a new conceptual framework for understanding heroism and heroic leadership, drawing from theories of great leadership and heroic action. Ten categories of heroism are described: Trending Heroes, Transitory Heroes, Transparent Heroes, Transitional Heroes, Tragic Heroes, Transposed Heroes, Transitional Heroes, Traditional Heroes, Transforming Heroes, and Transcendent Heroes. The authors describe the lives of 100 exceptional individuals whose accomplishments place them into one of these ten hero categories. 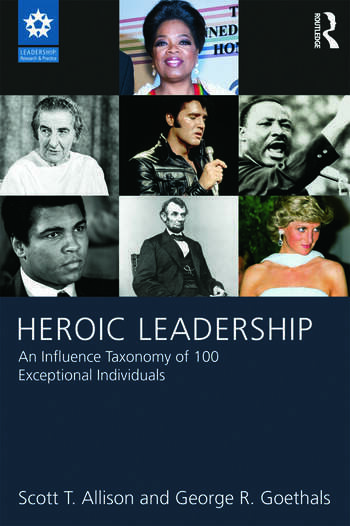 These 100 hero profiles offer supporting evidence for a new integration of theories of leadership and theories of heroism. Scott T. Allison is Professor of Psychology at the University of Richmond, where he has been on the faculty since 1987. He received his BA in Psychology from the University of California, San Diego and his PhD in Social Psychology at the University of California, Santa Barbara. His research program focuses on human belief systems about heroes, villains, legends, leaders, underdogs, and martyrs. He has served on the editorial boards of the top empirical journals in experimental social psychology, including the Journal of Personality and Social Psychology, Personality and Social Psychology Bulletin, and Group Dynamics: Theory, Research, and Practice. With George Goethals, he is author of Heroes, What They Do & Why We Need Them, published in 2011, and “Making Heroes: The Construction of Competence, Courage and Virtue” published in 2012 in Advances in Experimental Social Psychology. He is the recipient of the University of Richmond's Distinguished Educator Award and the Virginia Council of Higher Education's Outstanding Faculty Award. George R. Goethals holds the E. Claiborne Robins Distinguished Professorship in Leadership Studies at the University of Richmond. Previously he taught at Williams College where he was Chair of the Department of Psychology, founding Chair of the Program in Leadership Studies, Acting Dean of the Faculty, and Provost. Goethals graduated with a BA from Harvard College and holds a PhD in social psychology from Duke University. Goethals explores leadership from psychological and historical perspectives. With Georgia Sorenson and James MacGregor Burns he edited the Encyclopedia of Leadership (Sage, 2004), with Sorenson, The Quest for a General Theory of Leadership (Elgar, 2006), and with Crystal Hoyt and Donelson Forsyth, Leadership at The Crossroads, Psychology and Leadership (Praeger, 2008). His recent research focuses on presidential debates, the presidency of Ulysses S. Grant, and the role of biography in shaping our understanding of leadership. With Scott Allison, he is author of Heroes, What They Do & Why We Need Them, published in 2011, and “Making Heroes: The Construction of Competence, Courage and Virtue” published in 2012 in Advances in Experimental Social Psychology, Volume 46.